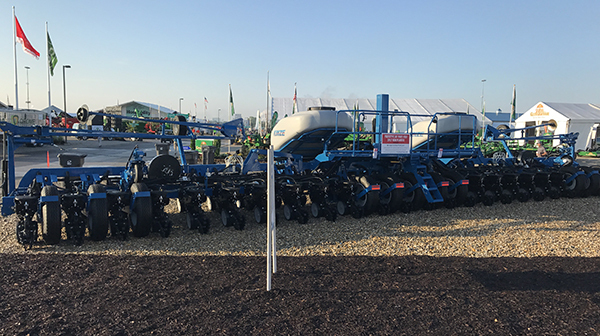 WILLIAMSBURG, Iowa (Aug. 29, 2017) – Demonstrating its commitment to continuous innovation, Kinze Manufacturing is displaying an advanced, patent pending prototype 60-foot planter at the 2017 Farm Progress Show offering improved safety and functionality for farmers with large field operations. The prototype has a center pivot, narrow 12-foot transport design for safer road travel and improved maneuverability in and out of the field. It is the narrowest transport width in the industry for a 60-foot split row planter, in most cases eliminating the requirement for a road permit. Excellent serviceability and better residue flow with Kinze’s exclusive 24-inch high parallel toolbars with cast push and pull row units. Ability to be used for both 24-row, 30-inch corn planting and 15-inch soybean planting in large fields for increased productivity. Three-section flex frame, good planter balance and positive hitch weight to deliver, consistent planting and greater overall functionality. Veatch said a timetable for design completion and introduction of the prototype has not yet been determined. New bulk fill tanks for the proven, durable, 8-row 3500 planter, Kinze’s first small frame planter with this option. With two 25-bushel tanks, increased seed capacity means less time required for refills and higher productivity. This cost-competitive offering is available to order now for 2018 planting with split-row and liquid fertilizer options. Kinze is now offering industry-leading Camso brand tracks on the new series 1105 and 1305 dual auger grain carts and making tracks available for the first time on the 1051 single auger grain cart. These tracks offer greater durability, easier maintenance and reduced soil compaction. The Camso tracks, combined with Kinze’s modular cart construction, heavy 20-bolt hubs, industrial-grade cylinders and unload speeds up to 750 bushels a minute, provide farmers with a rugged, durable cart for efficient harvest. The dual auger grain carts will also be equipped with a new joystick to handle four cart functions: tip spout, horizontal auger on/off, flow gate and auger tilt. This new joystick provides a more user-friendly, intuitive, ergonomic design for easy operation. The joystick will also be a retrofit option for existing dual auger Kinze carts. Both Camso tracks and the joystick are available to order in November 2017 for the 2018 harvest season. Kinze will also showcase its patented, highly versatile flex-frame 4900 planter, displaying both ground contact and electric drive. Also available with hydraulic drive option; vacuum, brush or finger meters; 12, 16 or 24 rows; and bulk-fill or row unit box options, the 4900 planter allows farmers the flexibility to build a planter to their desired specifications. The Seed Meter Test Stand on display at the show further demonstrates the accuracy of seed drop spacing for the various Kinze seed meter options. For additional information, farmers can contact their Kinze dealer or visit Kinze.com. Founded 51 years ago on the premise of innovation, Kinze Manufacturing, Inc., markets its planters and grain carts globally and is known for a number of industry “firsts.” Kinze operates with core values of integrity, customer focus, excellence, innovation and mutual respect. Kinze Manufacturing is the recognized technology leader and innovator of planters for row-crop production and grain auger carts. Kinze employees spend their nights and weekends farming, putting them in a unique position to be both manufacturers and customers of the planters and grain carts they build. © Copyright 2016 by Kinze Manufacturing, Inc. All rights reserved. Kinze® and the Kinze™ logo are trademarks owned by Kinze Manufacturing, Inc. Kinze Manufacturing, Inc. reserves the right to make changes in engineering, design and specifications, or add improvements at any time without notice or obligation. Click on the link below to download a PDF of this press release.